Come and enjoy a long or short stay in our gites. For us, having visitors is a wonderful way to breathe life into our beloved hamlet. 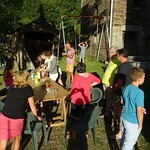 Barbecues, petanque competitions, playing in the pool, enjoying some tennis, the sound of kids enjoying themselves... From the moment you sip your 'welcome drink to the day you pack your bags, there's no better way for you to enjoy France and for us to know that our 'family' home continues to thrive. You are, after all, part of our story and the reason why we love spending winter months working on our properties and land. You'll love the Thouy hamlet and the Sidobre, and by holidaying in our little corner of France, you'll also be able to explore our fascinating local culture and heritage.